Six Ponies by Josephine Pullein-Thompson is the first book in the ever popular Noel and Henry series. The novel introduces the reader to the somewhat unruly members of the West Barsetshire Pony Club, which is run by the well reputed and long suffering Major George Holbrooke. The story of Six Ponies commences when the Major’s cousin, Colonel Harry Shelbourne, offers to him six unbroken New Forest ponies to break, train and prepare for sale. Major Holbrooke eagerly accepts his cousin’s offer and with permission, decides to lend the ponies to six Pony Club members as a special assignment in breaking and educating ponies. He believes the task will be a valuable learning curve for the children, from which they will all immensely benefit in horsemanship terms. 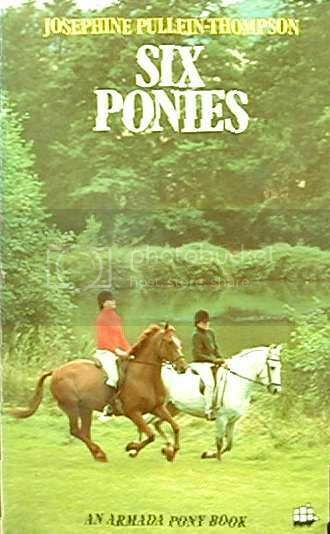 The Pony Club members who are lucky enough to be granted a pony give the story its main characters, and it is around these children that the story revolves. The author has an immense talent for creating believable characters from all walks of life. All of the members have unique personalities, come from varied backgrounds in life and have a broad range of riding abilities and experience. Most are likeable, others not so! Yet they have one thing in common – to succeed at their task. With much excitement and anticipation, the breaking and training project begins. The Pony Club members set about their task with great determination, however they soon discover that breaking and schooling a young pony is not as easy as they first imagined. Much to their surprise, they find that patience, plenty of hard work, thrills and spills, joy and frustration are all involved in their special assignment. Throughout the story, the children and ponies regularly attend Major Holbrooke’s Pony Club rallies and instruction days and also organise a fun day amongst themselves. The members are informed that at the end of the project a gymkhana will be run featuring a special class for the best trained pony, which will be judged by the Major’s cousin. Upon hearing this news, each member decides that his/her pony must simply win this event and beat all of the other ponies, fair and square! During the lengthy schooling task, the Pony Club members face many personal challenges with their ponies which ultimately affects their personal success. One character loses complete interest in the project and totally ignores their pony, and at their parents insistence following a riding accident, a different member has their pony sent back to the Major for keeps! And much to the Major’s horror, he witnesses one of the children losing complete patience with their pony. Six Ponies concludes with the highly anticipated Pony Club gymkhana, which brings about many surprise results - especially for the winner of the best pony class who is given a wonderful prize. Now that their special assignment is over, the members, their families and the Major realise that not only have the children taught the ponies much, but that perhaps most surprisingly in a role reversal situation, it is the ponies who have been the most wonderful schoolmasters themselves. For each child has gained different values from their task in both horsemanship and personal terms - of which only a pony could teach in its own unique way! Major George Holbrooke – Head of the West Barsetshire Pony Club. Wise, patient and an extremely knowledgeable horseman. Long suffering in dealing with noisy, disorganised and often rude children. Manages to bring out the better qualities in most of the children and their riding abilities. June Creswell – snobby, conceited, self promoting and scornful to all. Has a pushy and extremely Irittating mother who places June on a pedestal. Expects to win all the time. A bad loser. Blames everything on her pony, or others, when things do not turn out as expected. Trainer of Grey Dawn. Richard Morrison – temperamental, patronising, idle and lazy. Unmotivated in furthering his riding ability. Is resentful towards his family and other Pony Club members. Trainer of Rufus. The Radcliffe family – Roger, Hilary and Evelyn (twins), Margaret and James. All are redheads with tempers to match. A very noisy bunch of children. Their father is the local doctor and they refer to him as “Doc”. Trainers of Rocket and Romany. Noel Kettering – quiet and emotional but is kind and has a very pleasant disposition. Vague and forgetful. Is often caught daydreaming. Does not have any faith in her riding abilities. Trainer of Romany. John Manners – short tempered, impatient, condescending and headstrong. Son of a local farmer. Works long hours with his father attending to their harvests. Trainer of Jet. Susan Barington-Brown – friendly, level headed and down to earth, her wealthy father pays for whatever she desires. Unaffected by her status. Enjoys socialising with the other members. Usually very chatty and often found giggling about something. Trainer of Sunset. Six Ponies is written in a light hearted, thoroughly captivating and engaging manner which is a distinct feature of the author’s unique style. Both humorous and serious moments are well balanced throughout the story. A fair amount of horsey instruction appropriate to the novel is also featured. The plot is original and the story flows well, is intriguing and very easy to read. Although a vintage pony novel, the appeal of Six Ponies is timeless and therefore it is easy to understand why the book remains one of the most popular in the history of pony fiction. It is fair to say that the novel would be considered the most highly rated of the author’s many pony fiction books and that her popularity continues to grow in today’s modern times. The book is illustrated and contains several drawings from the original 1946 publication, and in particular features a few sketches of children riding their ponies without helmets. An interesting fact regarding the later editions published is a note from the author which appears at the beginning of the book endorsing the new Pony Club rule of compulsary use of crash caps at all functions. Six Ponies is my most treasured and favourite pony novel of all times and holds pride of place on my bookshelf. I first read the book aged about 9 years and even though it had great impact and was firmly etched into my memory, I now find myself as an adult re-reading the book at least once a year purely for total enjoyment. After reading the novel it left me keen to read the further books in the series. Six Ponies is a brilliant and original story which should appeal universally to both young and older horse lovers alike, in fact I do not know of one person who has not enjoyed reading this book. I highly recommend it to all pony mad folk, and for me this book is absolutely worthy of the most highest rating possible. Rated 5 horseshoes! I totally agree with Ree’s review of Six Ponies and would rate is just as highly. It is one of J P-T’s best books, although I think I just slightly prefer Pony Club Camp. Six Ponies is a classic pony book in the sense it does not need stolen ponies, kidnappers and the like to spice up the story but instead relies on good old-fashioned stuff like character and excellent writing. It manages to be light-hearted, funny and entertaining whilst at the same time teaching the reader valuable lessons about horsemanship and life itself. Brilliant! I think you said it all between you Claire and Ree. Not my favourite, I also prefer camp, but a classic all the same. Six Ponies is one off my favourites as well, I have a old hard cover exlibery copy. It's years since I read this...I should treat myself to the Fidra reprint. Does Henry appear in this? It is always referred to as one of the "Noel & Henry Books" but I cannot recall him making an appearance. Your right he didn't appear until Team. When he first appears you think what a pompous twit ;D but you soon get to like him! This series was so funny. What gets me is how JPT had such a sense of humour in her books...and it seemed to bypass her sisters novels completely! Yes I love the humour in JPT books I like her a lot. Which editions of the Noel and Henry books would NOT be abridged? I just treated myself to the Fidra reprint of Team (they are currently out of Six Ponies, unfortunately) and I don't want to read edited versions if I can avoid them. Thanks for any advice! Oh that's spooky! I had some vouchers for christmas so I ordered myself Six Ponies and Pony Club Team from W.H.Smith. Not sure if that's any help to you rallycairn? I think unfortunatly it's only the first editions and immediate reprints that are unabridged bar the fidra two. Six Ponies is definatly the most brutal with large chunks taken out, the others have more subtle abridgements. I have sent you a pm with the details of a uk based fidra stockist who has six ponies in stock. Just realised the person I sent you details about is already in Rosies ebay link! Great, thanks for the resources! Pah! W.H. Smiths now tell me they don't have Six Ponies in stock...after saying they did and taking my money! Apart from the bit where Richard is dressed down at the end, I actually prefer the abridged version! I think it is less rambling and more coherent than the first edition. I have a feeling it was cut mainly to make it lighter in tone and in keeping with the rest of the series, the first edition being a lot darker in tone than the other books. The main miss from the abridged versions are the missing extra illustrations. A copy has just arrived today from the seller that was in my link above but I notice they don't have anymore for sale now though! I'm really looking forward to getting stuck into it as I haven't read any of this series at all. Rosie you are in for a treat! Oooh lucky you reading them for the first time!!! I've just finished it and I can see why you all rate it so highly. What a great book! And now I have Pony Club Team to look forward to. I just recently got around to acquiring Six Ponies. It is definitely a great book! Outstanding in the characterization and details of the ponies' schooling. However, despite plenty of humor deriving mostly from the children's impressions of one another and the alliances that form and re-form among them, I wouldn't call the book especially lighthearted. There is really a lot of "beating" and harsh schooling of the ponies. Although Romany and Jet end up being fairly treated, they go through some rough times first with Evelyn and John, respectively. They are overfaced and then punished, and very harshly, simply for not understanding the task. Rufus is also very neglected, and always given poor fitting, pinching tack and bits that don't fit and hurt his mouth. Every time, not just the first time. Grey Dawn does get a bit rushed in her schooling, and gets overbent and rushed to show fake collection that is really just overbending, and June is conceited and spoiled -- but I have to give her credit, she's never depicted in this one as being overly harsh with or "beating" her ponies. Honestly, I find her a better person than the likes of Richard, Evelyn, and John (until he changes) -- at least she doesn't abuse her animals even if she is insufferable to the other kids and bratty with her mother. Rocket fares well with Hilary, the odd duck in her family in that she is always thoughtful of her pony and also concerned about her siblings (she wouldn't have left Marga behind during the paper chase, as Evelyn did, and also as Richard did with Jill although Jill never got completely lost). And Sunset's attentions from Susan are not as organized and consistent as they should be, but at least Susan is also very kindhearted and always thinking of her ponies' welfare, refusing to trot them on the roads or hurry them when they are tired even if she is late and going to be in trouble with her mother for being late. So half of the ponies really have a rough time of things, and for Rufus this doesn't change in the context of the story, though I do think it is implied the Major will see to it that he gets better training. I also wonder if, even given the much more relaxed time, it was realistic to depict giving one's cousin's ponies to six children that one really doesn't know very well, to take off and keep on their own, and back them for the first time and train them to saddle. Maybe if they were all to keep the ponies at Folly Court and work with them there, it might happen, but these kids really don't know much and yet they are sent off with the ponies to have almost completely on their own without supervision. I also think I would have found it more believable if they had at least been green broken before the children took them. Although I'm sure even in the 1940's they had the saying, "a green rider and a green horse are a poor color combination" so I am still left wondering what the Major was thinking! Still a great book, with wonderful characterizations, and I love books about day-to-day interactions with horses, training and schooling, and prepping for the big competition. Generally a very satisfying read, though a bit hard at times reading all the beatings literally half the ponies get (actually, Wendy and Pixie get some rather unfair beatings, too, when faced with fences much too big for them). I feel the need to point this out somewhat in response to Ree's original review, which implies the book is much more madcap and lighthearted than I find it to be. I feel the author had not only a serious intention of spreading the "gospel" of the forward seat, but also of kind, consistent training and schooling for ponies. Hi rallycairn. Interesting and insightful review of the book. Which edition are you reading? As there is a huge difference between the early editions and the paperbacks, in that the paperbacks have been edited extensively and are of a completely different tone to the earlier ones. The first edition was much darker in tone and not really humourous at all. The later editions were edited to get rid of some of the darkness, which was I think to tie in with the later books in the series which were much more humourous. However even in the edited version I do find this is the least humourous of the series. There is a lot of harsh treatment of the ponies but it is never condoned and usually those who behave badly to their ponies (and indeed to people) get their come-uppance. I think the incident where John beating his pony and being chastised by Major Holbrooke is extremely powerful and in fact the image of it has stayed with me ever since reading it as a child. If I had been a child who was careless of animals' feelings I think this would have made me change my ways! As with all the series the book was very didactic but done in such a clever way it never seems that way to a child reader. Claire, I waited for Fidra to do another print run and so have the re-creation of the original. I agree that the harsh treatment is not condoned with regard to John, certainly, and Evelyn, though really there's pretty harsh treatment of ponies by some of the minor characters as well that doesn't clearly get the negative consequences. I actually like the book very much as it is -- again my point in mentioning this is that I felt like the book, while wonderful, isn't some sort of high-jinks-filled school story set in a pony world (though it does have some similar elements), but rather something a bit more serious. Well if you were reading the original text Rallycairn, its no wonder you found it quite serious. If you ever come across the Armada edition try reading that and you will be shocked at the difference, not only as they miss so much out but because the tone of the book is very different. (Altho it did keep the incident with John beating his young pony). The original review by Ree was the Armada copy.